Phenyl Ethyl Formate 104-62-1 is liquid. 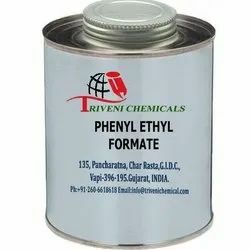 it is also known as Phenylethyl Formate, Formic acid 2-phenylethyl ester, Benzyl carbinyl formate and 2-Phenylethyl Formate. it is use in perfumery, food flavours, Aromatic, cosmetic, Soap Detergent and Fraganance Industry. Storage: Keep container tightly closed. Keep container in a cool, well-ventilated area. Dihydromyrcenyl Formate (25279-09-8) is colorless liquid. it is use in Flavor & Fragrance, Aromatic, Perfumery, Cosmetics, Soap Detergent and Agarbatti Industry. Storage: Keep container tightly closed. Keep container in a cool, well-ventilated area.